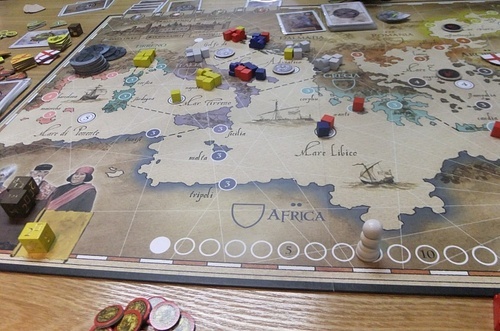 Another diamond in the rough made by Passport Game Studios, Venetia is a game of control and colonies. Now I’m a big fan of competitive games like this so I was pretty excited to dive in, I’d never heard of it before but this game has a lot of historical content to it which, in my book, gives it another few points. Diving right in the box is high quality, thick and sturdy. The components are easily punched but still thick and sturdy. Another point that I am a big fan of. The cards are also high quality and so far that seems to be the norm for Passport Games, big ups to them for that. The initial setup is not very hard as the components are nothing new for people who have a few board games under their belt. One thing of note you’d do well to grab a couple of old dice bags or something similar because this game has a component not unlike eclipse in the form of victory points and battle tokens you have to pick at random. Having a bag to keep these in will be handy. 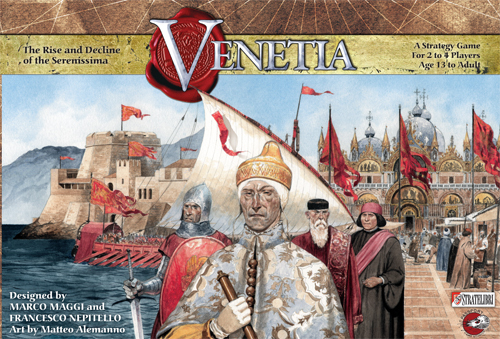 The game is played in three rounds, each consisting of an era in Venice. In the initial stage of the game everyone bids one member of their house and a card from their hand and the one who wins becomes the Doge for the first round. The Doge gets tokens that can be used for extra actions or victory points. Throughout the game you will draw cards and each card has a number of coins at the bottom. In order to win the next Doge election you will have to bid using these cards by placing them on your color on the top of the board. The game itself revolves around a set of ‘Action Dice’. You roll the dice and the players begin by selecting one of the three sets of dice. You take a number of actions as indicated on the dice, and in some cases you get to draw a card. If you’re taking less actions by selecting the 2 dice, you draw. If you take four actions everyone else gets to draw a card. When taking actions on the board you must have a line to the place you wish to go. Every ocean tile and city tile has a number associated to it. In the case of oceans you must place one of your cubes on each tile until you reach this number. Once you have reached that number you place a token on that section and you may start from there from then on. In the case of cities each of the dice do something different. Once die gives you the ability to place multiple tokens on a colony, another lets you put multiple tokens on different colonies and the last makes you draw battle tokens. Battle tokens can be good or bad, just like any other cards you draw. Each city you can colonize requires a number of tokens in it to in order for you to put down a podesta (and get bonus points). The player with the most colonies in a city puts down a podesta and this can change as the game goes on and more players add cubes. When there are more than six cubes on one city everyone has to remove one. Each epoch changes What happens when you draw a card to take an action. Other empires may show up. The flags and fleets that show up can be taken out with actions and each of those gives you victory points. Easy enough. When a podesta is put out you move the token along the bottom track. When you hit the end of the third Epoch the game is over. In the end I like the mechanic of the action dice, I like the components, I like the theme and feel of the game. I would have like to seen a little more in the way of conflict between players. There are a lot of fiddly bits that come with the game as well. You’ll be moving pieces around a lot. The action cards also range in power which can feel unbalanced. The game does have a little bit of chaos, but such is life. Venetia can get bogged down at times when someone picks four actions and takes forever on their turn. In the end I can honestly say it’s a good game to have but not a must have for your shelf unless you love historical games. ~ by lordnightwinter on April 6, 2015.